Your skin's greatest enemies! | My Beauty Channel My Beauty Channel: Your skin's greatest enemies! Ok, so today I am going to identify our skin's biggest enemies and some bad habits we often take for granted that ruin the our skin. Early last month, I posted on 6 easy ways to achieve beautiful skin naturally and I noticed that in order to have beautiful skin, we MUST also brush off those bad habits / lifestyle that contribute to bad skin that I will be emphasizing below because without amazing skin, no matter what good make up you put on, you will never achieve your desired results. 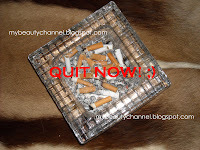 A smoker's skin looks older than a nonsmoker's and there is no denial on this. Every cigarette smoked releases 1,000 billion free radicals, which run riot with the supportive collagen and elastin network, ultimately causing skin to sag, wrinkles to form faster and dull skin tone. When you smoke, your blood vessels are choked, thanks to nicotine thus reducing the amount of oxygen and nutrient-rich blood that is being carried to the superficial layers of the skin. For those who suffers acne and post acne scars and if you are a smoker, it is time for you to consider quitting if you want acne to lessen and scars to heal faster. So, if you want brighter and healthier skin, throw away those cigarettes and you will notice how much nicer your skin looks, very soon! When I posted a topic on Do We Need Sunscreen, I received feedbacks such as "duh, of course!" Yeah, of course we need sunscreen, but how many of us actually use sunblocks?! I have seen so many people omitting sunscreen in their skincare. I am not referring to women only, but men as well. The sun is very harmful and causes up to 80% of age-associated skin problems such as deep wrinkles, fine lines, sagging skin, sallow tone and liver spots! Generally, it has been said that the lighter your skintone, the more prone your skin to sun-related aging. Then again, always remember that even black skin needs protection from the sun. So, start applying sunscreen please regardless of your skin type or skin tone. We need to care of our skin as like how we care for our safety when we dance the night away. Many of us will feel exhausted and sleepy after a night out and simply go to bed without removing our make up. Well, it is ok not to brush your teeth when you are too tired (SOMETIMES only, not all the time of course!) but NEVER skip facial cleansing unless you want ugly wrinkles fast and easy. Always double cleanse your skin before going to bed. As a short cut, keep cleansing wipes in your purse, you can easily wipe those make up off on your way home or place a pack of cleansing wipes on side table beside your bed - it is always better than not cleansing at all. Stress equals weak skin. Put aside daily stress for some moment and take time to unwind. Relaxation helps to strenghten skin barrier function, making skin less vulnerable to acne and fine lines. So, learn to relax. We all want to look slim but do you know what dieting can cause breakouts? YES! Dieting weakens the skin fibre thus trigerring unwelcomed breakouts. If you must go on a diet, do seek a nutritionist for professional consultation. I emphasized the importance to exfoliate on my on 6 easy ways to achieve beautiful skin naturally but remember, it is best to scrub or exfoliate once a week for normal skin and twice a week for oily skin. Never over scrub to prevent stripping away your skin's natural oils. This is my worst ever habit. I do not have enough zzz, because I always sleep late watching youtube, reading blogs and playing with my make up. Lol! Lack of sleep not only produces dark eye circles (thank God I don't have them yet! ), but releases stress hormones which will jam oxygen flow and nutrients to the skin. So, try to sleep early (look who is talking! lol) and get at leastt 7 hours of beauty sleep each night. Thanks for that, some useful advice. I also advocate drinking water throughout the day. Skin can look sallow if you are not hydrated.